The Macron Southern Combination Football League is a football league broadly covering the counties of East Sussex, West Sussex and southeastern Surrey, England. Formed in 1920 as the Sussex County Football League, the league now has six divisions – three for first teams and three for reserve sides. The first team divisions – Premier, One and Two, sit at Steps 5, 6 and 7 of the English football league system, below the lower divisions of the Isthmian League and the Southern League. The reserve divisions are not part of the league system. The league changed its name to the Southern Combination Football League for the start of the 2015–16 season, and at the same time renamed the divisions Premier Division, Division One and Division Two. Also, for the 2015–16 season the league added two U21s divisions, one in the East, and one in the West, these two leagues consisting of 7 teams each. The Reserve leagues were discontinued, and the U21 divisions replaced by Under 23's, at the end of the 2017–18 season. Macron Sportswear signed a 4-year deal beginning 2014/15 season resulting in the official name being changed to "The Macron Sussex County League" and then to current "The Macron Southern Combination Football League". The league originally consisted of a single section of 12 clubs, and had reached a stable membership of 14 clubs when it was abandoned on the outbreak of World War II. The area covered by the Sussex County League is coloured in dark blue. 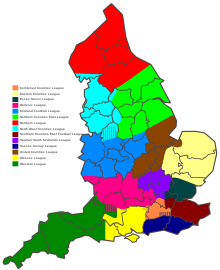 For the first post-War season, the league also operated two regional divisions, East and West, with the winners of each facing each other in a play-off. After a single split format, the league reverted to a single division for the next six seasons. A second division was instituted in 1952. A two-division format continued for over 30 years, the only deviation being in the 1962–63 season when the terrible winter made the league impossible to finish. The normal league competitions were abandoned and a set of emergency competitions were played for in the second half of the season. After a two division format had proved sufficient for over 30 years, a third division was added in 1983. While the top two divisions were for clubs holding senior status with the Sussex FA, the new Division Three was for clubs of intermediate status. In 2015, the Sussex County Football League was re-branded to the Southern Combination Football League, keeping the acronym SCFL. The divisions were renamed to Premier Division, Division One and Division Two, Division Two clubs still holding intermediate status. ^ "About the Sussex County Football League". Sussex County Football League. Retrieved 12 January 2012. ^ "Sussex County Football League to Change Name – News – Haywards Heath Town FC". haywardsheathtownfc.co.uk. Retrieved 10 April 2018.